Although it’s probably hot enough for polar bears to wear sunscreen this summer, it’s never too early to start thinking about your winter vacation in a tropical climate. The Caribbean and its beautiful islands, sandy beaches and festive umbrella cocktails are often the go-to destination for those looking to escape the snowy winter. Unfortunately, high demand also means high prices. So how do you avoid the hefty price tag when it comes to traveling to the Caribbean? Having a healthy balance of Ultimate Rewards can help. Let’s take a look at the possible redemptions with Chase’s transfer partners. This latest addition to the Ultimate Rewards program is a great option when it comes to redeeming points for award flights. The airlines belong to SkyTeam alliance and partner with Delta Air Lines. As long as there’s a low-level seat available with Delta, you can book it with Flying Blue miles. The program charges 30,000 miles for a round-trip flight in economy and 60,000 in business class anywhere in the Caribbean region. This award can be booked on AirFrance.us. Flying Blue doesn’t partner with only Chase so you can also pool points from other programs because the frequent flyer program actually partners with all major flexible point programs, including American Express Membership Rewards, Citi ThankYou Points and Starwood Preferred Guest. If you have odd balances in all these programs, it’s possible to combine them into Flying Blue to book an award flight. British Airways utilizes a distance-based award chart, which means that the number of miles to book an award depends on how far the destination city is from the departure city. Knowing this rule will benefit those travelers located on the East Coast. British Airways is part of the oneworld alliance and partners with American Airlines. BA’s search engine is not the most user-friendly, and for this reason I recommend searching for space on AA.com first. If American displays SAAver seats, you can book them with Avios. For example, a one-way flight from Miami to Grand Cayman is 453 miles long and comes to just 7,500 Avios in economy. In comparison, booking the same one-way flight with AAdvantage miles costs 12,500 miles at the Economy MileSAAver level. Your results will vary, depending on where you fly from and the desired destination. Korean Air is one of those odd partners not many travelers are familiar with, but the airline’s award chart is quite lucrative for those with Chase Ultimate Rewards points. A round-trip flight to the Caribbean operated by SkyTeam partner Delta requires 35,000 SKYPASS miles. Only round-trip SkyTeam awards can be booked, and low-level awards have to be available on Delta.com. Although redeeming Korean Air miles can be tricky, the airline recently made it a bit easier by displaying partner award availability online. Passengers used to have to call the airline to hold space before transferring miles. Yet, booking flights for anyone but the account holder still requires pesky paperwork. If you’re traveling with an authorized user on your Ultimate Rewards-earning card, I recommend transferring points to your companion and having them book a flight with their own SKYPASS account instead of booking both awards from one account. Unfortunately, booking partner awards with Singapore KrisFlyer program requires calling the airline at 312-843-5333. You can only book Saver flights, so I recommend searching for availability on United.com first. Singapore charges the same number of miles as United for flights to the Caribbean—35,000 miles in economy and 60,000 in business class—so there’s no real benefit to using one program over the other, except if you do not have enough Ultimate Rewards points to transfer to United. Similar to Flying Blue, KrisFlyer partners with all major bank point programs, so it’s possible to combine your Chase points with Citi ThankYou Points, for example, to book an award. And now on to everyone’s favorite frequent-flyer program — Southwest Rapid Rewards! 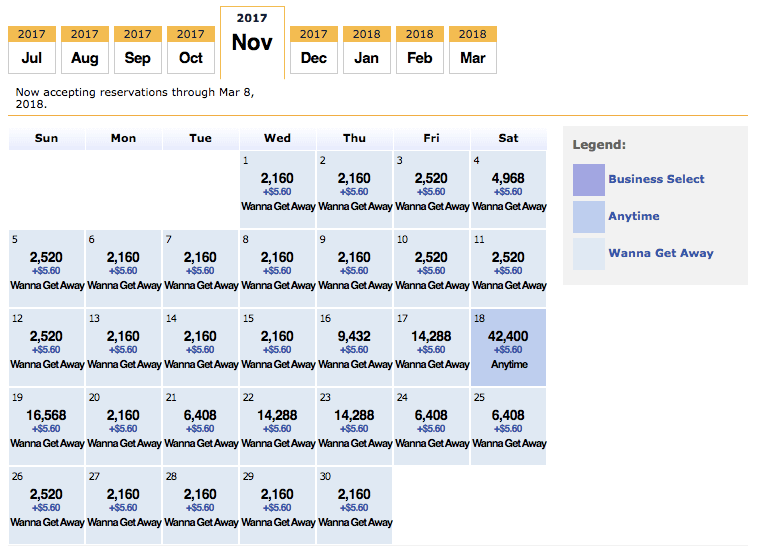 Southwest Airlines utilizes a revenue-based award chart, which means there’s no set number of points to redeem for a certain award flight. That number directly correlates to the cash cost of a ticket, which means shopping sales will produce the best results. Luckily, Southwest is rather generous when it comes to flight sales. The airline has been expanding its list of international destinations and recently began flying to Grand Cayman from its Fort Lauderdale hub. One-way Wanna Get Away fares from Fort Lauderdale to Grand Cayman in November can be booked for as low as $59, or just 2,160 Rapid Rewards points. If you ask me, that’s quite a bargain! Your results will vary, depending on the itinerary and its revenue cost. United Airlines is one of the most popular airline transfer partners of the Ultimate Rewards. This Star Alliance member and its partners fly to many Caribbean islands, so take your pick and enjoy. United requires 35,000 miles at the Saver level for a round-trip between North America and the Caribbean in economy class, or 60,000 miles in business. Don’t forget that United MileagePlus Explorer Card members have access to expanded Saver award availability on United-operated flights, which might mean more flights to choose from when picking a Caribbean destination. Virgin Atlantic’s mile redemption levels are on par with its partner Delta. Flying Club requires 35,000 miles for round-trip award flights between the U.S. and the Caribbean in economy class and 60,000 miles in business class. To book these awards, passengers have to call the Virgin Atlantic Flying Club team at 1-800-365-9500. Make sure there’s low-level availability for your travel dates on Delta before calling. Investing in a flexible currency such as Chase Ultimate Rewards gives flyers just that—flexibility. Having multiple options when it comes to transferring your points and not being tied down to one airline or one alliance is key to successfully redeeming your points for travel. You can accumulate transferrable Ultimate Rewards points with Chase Sapphire Preferred, Chase Sapphire Reserve and Chase Ink Business Preferred cards.